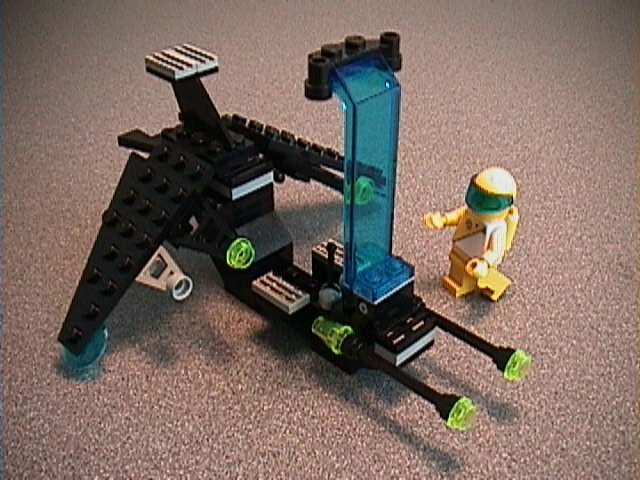 The Dark Futurons created this ship, modeled after a Blacktron II cockpit module, to delve deep into enemy territory and steal ships. This is identical the original Blacktron model in most respects, but has been recolored for Dark Futuron use. This small armed freighter can haul its loads through hostile territory. PolyTech Industries manufactures automated piloting drones that can dock with any standard UCI-type cockpit socket. UniCarg is still designing ships to haul their older large cargo modules- this one is a medium-sized interstellar transport with 2 cockpit mountings and removeable engine pods. UniCarg stopped making the Mule many years back, but there are still quite a few in service. It isn't pretty, but it is a very low-maintenance vehicle that can haul multiple large cargo modules. This is UniCarg Industries' newest addition to their interstellar line- a medium-sized transport equipped with a small crane and an android helper crew. This "spine"-style ground vehicle is one of the workhorses of UCI's universal cargo system. It is fitted for carrying cargo modules of many kinds. These shots show it in the role of aircraft carrier, holding 4 small recon flitters.